A comprehensive update, the fourth edition of this leading text features numerous chapters by new authors addressing the latest trends and topics in the field. 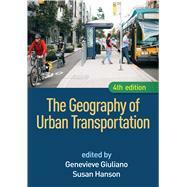 The book presents the foundational concepts and methodological tools that readers need in order to engage with today's pressing urban transportation policy issues. Coverage encompasses passenger and freight dynamics in the American metropolis; the local and regional transportation planning process; and questions related to public transit, land use, social equity and environmental justice, energy consumption, air pollution, transportation finance, sustainability, and more. Among the student-friendly features are special-topic boxes delving into key issues and 87 instructive figures, including eight color plates. *Extensively revised coverage of information and communication technologies, urban freight, travel behaviors, and regional transportation planning. *Engaging discussions of current topics: smartphone travel tracking, Uber, car and bike sharing, food deserts, biofuels, and more. *Heightened focus on climate change. *Reflects over a decade of policy changes, technological advances, and emergent ideas and findings in the field. *Most of the figures and special-topic boxes are new. Genevieve Giuliano, PhD, is the Margaret and John Ferraro Chair in Effective Local Government in the Sol Price School of Public Policy, University of Southern California (USC), and Director of the METRANS Transportation Center, a joint partnership of USC and California State University Long Beach. Her research and over 170 publications focus on relationships between land use and transportation; transportation policy analysis; and information technology applications in transportation. Dr. Giuliano is a past Chair of the Executive Committee of the Transportation Research Board (TRB), within the National Academies of Sciences, Engineering, and Medicine, and of the Council of University Transportation Centers (CUTC). She is a recipient of honors including the Thomas B. Deen Distinguished Lectureship Award from the TRB, the Distinguished Transportation Researcher Award from the Transportation Research Forum, and the Distinguished Contribution to University Transportation and Research Award from the CUTC. She is a frequent participant in National Research Council policy studies and a member of several advisory boards, including the National Freight Advisory Committee. Susan Hanson, PhD, is Distinguished University Professor Emerita in the Graduate School of Geography at Clark University. She is an urban geographer with longstanding interests in gender and economy, the geography of everyday life, and sustainability. Dr. Hanson has been editor of Urban Geography, Economic Geography, the Annals of the Association of American Geographers, and The Professional Geographer. She currently serves on the editorial board of the Proceedings of the National Academy of Sciences and is Division Chair for the Transportation Research Board, within the National Academies of Sciences, Engineering, and Medicine. Dr. Hanson is a member of the National Academy of Sciences, a Fellow of the American Association for the Advancement of Science and of the American Academy of Arts and Sciences, and a past president of the Association of American Geographers. 4. Impacts of Information and Communication Technology, Giovanni Circella & Patricia L.